Troon is pleased to recognize the company's 25-year anniversary in 2015! To celebrate the exciting milestone, a special anniversary issue of Troon Golf & Travel magazine has been published and distributed across Troon-managed facilities and select newsstands. Throughout the commemorative issue are exclusive stories that take a look back at the company's early days through the eyes of Chairman and CEO Dana Garmany and the employees who have been with the company since the beginning. Additionally, Tom Weiskopf, who co-designed the first course at Troon North Golf Club (with Jay Morrish), recounts some of his earliest memories of those days as well. 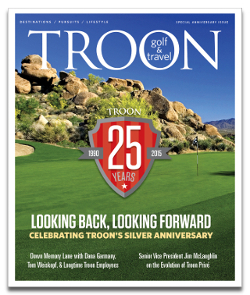 A third feature examines Troon from a business perspective, describes the company's progress through the years via a timeline, and details the top achievements along the way. Since its beginnings in 1990 with the management of the iconic Troon North Golf Club, Troon has grown to become the industry leader with more than 250 managed courses in 36 states and 27 countries and with international offices in Hong Kong, South Korea, Australia, Dubai and Switzerland. Major accomplishments in Troon's history include its first international expansion into Australia in 1998, along with its involvement with Turnberry Resort in Scotland the same year. Troon's international growth continued from that point expanding from 10 domestic facilities to more than 100 by 2007, reaching into parts of Europe, Middle East, and Asia. International expansion continued into Russia and Africa along with parts of North and South America to bring the company where it stands today as the largest third-party golf management company with more than 10,000 employees. After the recent transaction with Kohlberg & Company, new capital has been infused into Troon, positioning the company for accelerated growth in the golf and hospitality industry. In late 2014, Troon acquired Honours Golf, the premier golf management company in the Southeastern United States. The acquisition added 16 golf courses to the Troon portfolio, located across Alabama, Florida, Mississippi and North Carolina. During its 25-year history, Troon has earned a reputation for having pristine golf course conditions, personalized member service, outstanding food & beverage experiences and world-class retail offerings at its facilities. This reputation has helped Troon win the loyalty of millions of golfers with 95% of all guests who play at Troon-managed facilities indicating that their experience exceeds their expectations and 97% saying they would not hesitate to recommend Troon courses to others. Troon's expertise has grown to span across multiple areas of hospitality, taking its proven services to achieve success in homeowner association management, private residence clubs, estate management and associated hospitality venues. Within its current portfolio, Troon oversees operations at more than 20 spa facilities, 10 lodging facilities, 35 fitness facilities, 45 tennis facilities and 10 equestrian centers. Troon's resources combined with now 25 years of experience operating a myriad of private, daily fee, and resort operations in states and countries all over the world, have given the company the opportunity to develop the strategies and talent that the industry demands today. Combined with its past experience and strategic position for growth, Troon is poised to see its best years still to come.